First impressions are obvious – she’s a monster. This machine has some serious capacity and the sort of efficiency I like. Take a stroll out to the combine mid-morning, tidy up all the wheat on the farm with no fuss, and head off to the beach for dinner – it’s all about work-life balance! While the range-topping CR10.90 was the main attraction on this day, there are also five smaller models available. The CR10.90 generates a massive 700hp from the new FPT (Fiat Powertrain Technologies) six-cylinder, 15.9-litre engine. Topped up by the 1300-litre fuel tank, it enjoys 600-hour service intervals. To keep up with the regulations (Tier 4 B), an SCR AdBlue exhaust after-treatment (120-litre tank) is required, allowing less complication in the engine. 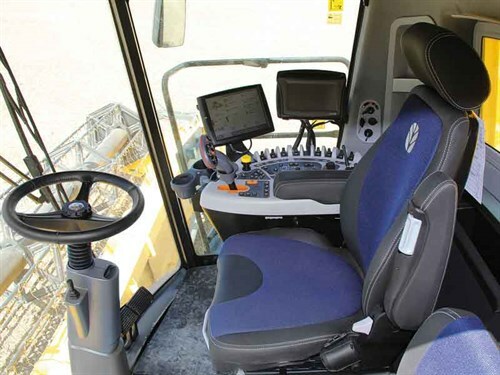 The first thing you notice is that the cab is a big step up from previous models; it’s more spacious, comfortable, and user-friendly and has a larger windscreen for better visibility. Hop aboard the leather bound, air-conditioned, and heated seat and you’ll discover it also has auto weight adjustment. This is great if you are skinny but a little demoralising if you hop on and think the compressor is broken because it won’t stop pumping. 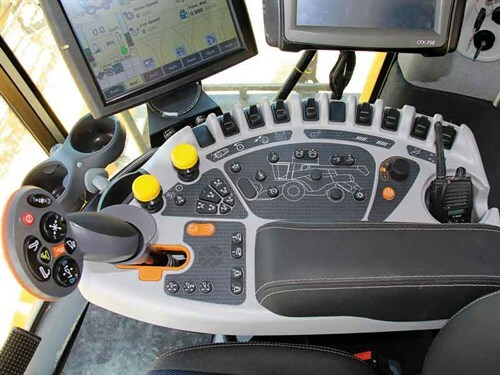 The right-hand console, where all the business happens, will be largely familiar to those who have operated or own recent high horsepower New Holland tractors. New Holland’s IntelliView IV touchscreen monitor allows you to customise the layout of the main screen, allowing storage of 50 different crop settings. As crop conditions change during the harvest day, small adjustments can be made. 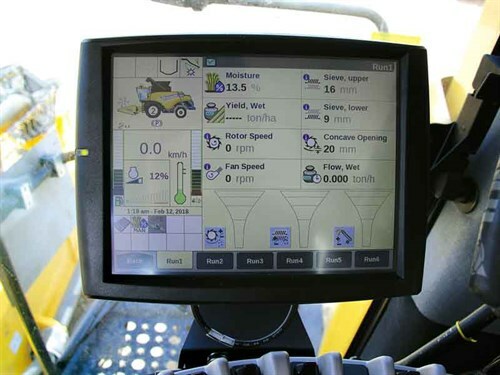 A second touchscreen can be added for functions such as yield metering, auto guidance, and cameras. This can be switched in and out of New Holland tractors, allowing greater flexibility in your business. Other comforts include an intuitive diagram showing all functions in relation to their location on the machine. Blinds on all four windows are useful for combining late in the day, and 26 (mostly) LED lights mean you can keep working through the night. 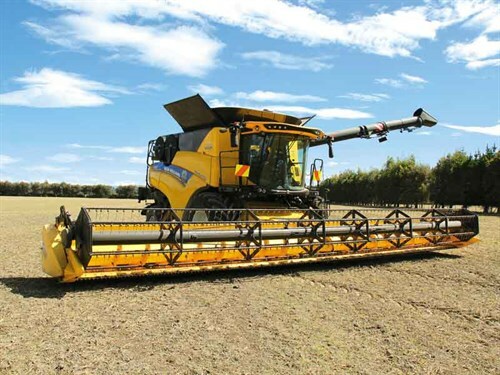 Deep cut Dynamic Feed Roller – the actual term on the 2018 machines – is a 450mm diameter cylinder, which runs at 1100rpm (for cereals) and as low as 640rpm (for delicate crops such as peas). It sits between the feeder housing and the Twin Pitch Plus rotors (more on that in a bit) and was initially designed primarily as a stone protection system. It has also led to a much higher capacity in the machines, allowing them to use all that power and reducing the risk of crop roping, especially in heavy, damp conditions. Putting a beater in seems counter-intuitive but grain damage is reduced due to the positive feed into the rotors by the DFR. This has allowed the twin rotor speed to be reduced and opens the concave clearance, increasing output, and allowing the machine to use a higher portion of the available power – of which it has plenty! It starts with the DFR, which positively feeds the crop off the front head first for an excellent presentation. 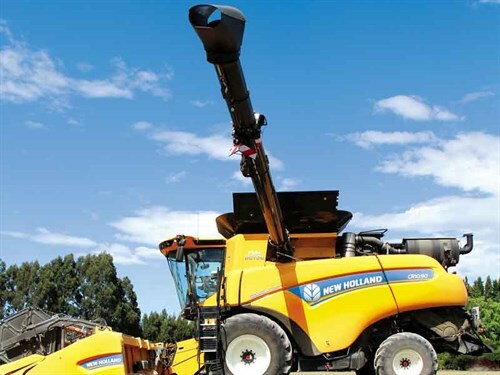 Feeding width is the same as the auger width, which means no crop narrowing, and then it enters New Holland’s clever twin rotor. New to the 2018 model is the Twin Pitch Plus rotor. While still the same 22-inch overall diameter, they are slightly narrower, with slightly larger threshing elements. International testing suggests 10 to 15% less power is required to get the crop through the machine. Twin rotors use simple physics to create more capacity, creating a cleaner grain sample.. It’s simple science and you can’t argue with science. If you’re wondering what type of physics I’m harping on about, it’s centrifugal force – a combination of speed, weight, and turning radius. In this case, the rate at which the crop mat rotates around the rotor of the combine. This is a constant. The size of the grain is about the same as the next one when the crop is harvested, so the weight is again a constant. This is where the twin rotor is unique to the market. As the combined turning radius of the two smaller rotors is smaller, there is a tighter spiral pattern of the rotor bars over the concave area. The spiral pattern then widens out over the separation area, creating a ‘break’ in the flow pattern. 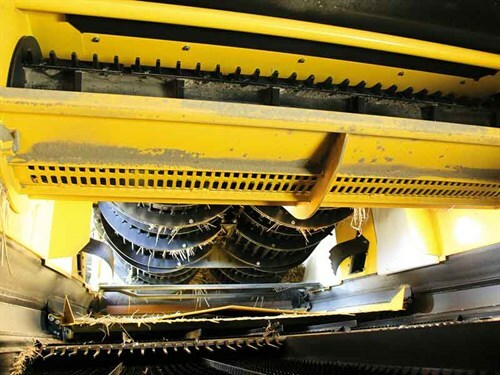 It creates more centrifugal force than a large single rotor, making grain let go faster, so there’s less of a crop mat, allowing material to flow easily through the machine. Twin rotors generate around 40% more centrifugal force than any other rotary design, moving grain quickly for faster separation. This significantly reduces grain damage and loss while being less power hungry to run. Dynamic flow control is another advancement on already proven technology, which has been upgraded for the 2018 model. This allows you to alter the rotor veins from the cab, either advancing or retarding the crop through the rotor for better threshing. 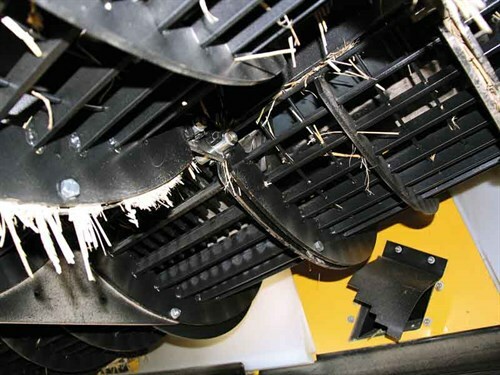 This also means the fan speed can be increased to blow lighter chaff and straw out of the sieve area quicker. Auto concave reset is another handy upgrade. Previously, a shear bolt was located on the concave. If you got a little too ambitious, the shear bolt broke and it all turned to custard. Now you simply reset from the cab, so no more half hour of mucking around emptying the grain tank, etc. to get the shear bolt to line up. You just reset and go. The entire cleaning system—the grain pan, cleaning fan, and sieves—remains level while the lower main frame moves up to a 15-degree pitch. Along with the ‘Opti-Fan’ automatic fan speed adjustment, this means less grain losses when going uphill and across slopes, making it no different to table-top paddocks. For the highest cleaning quality in all crops, the unique Opti Clean feature of operating the grain pan and lower sieve together (opposing the pre and upper sieve motion) while the grain pan angle is elevated, enables 120% greater cascade of material. This allows more air blast from the fan between the grain pan and the pre-sieve. Because the pre and upper sieves move opposite the grain pan, while the lower sieves move with the same motion as the grain pan, it results in optimal handling of small grains. These opposing movements in some way counter each other and reduce overall machine vibrations, resulting in greater operator comfort. Opti-Spread has been upgraded in the 2018 model, with two spinning rotors and two adjustable deflectors to evenly distribute chaff or chopped straw across nearly 14 metres. 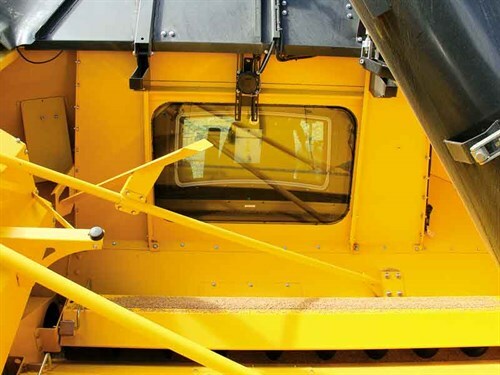 The feature can be controlled from inside the cab where you can alter both chaff and straw discharge to suit your requirements. Like all high-capacity machines, whether it is silage harvesters or balers, there will be a bottleneck somewhere. 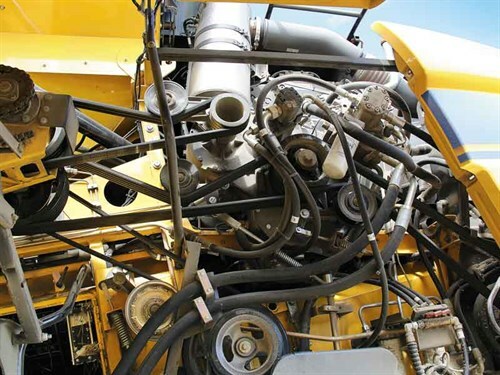 In combines, high threshing throughputs require high grain tank capacities. This is simple maths. 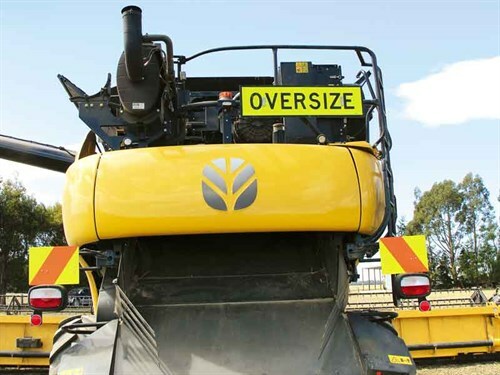 New Holland has a massive 14.5 cubic metre tank, with a fold-up lid, which can be operated from the comfort of the cab, and means the machine can be closed off at night. To deal with this extra throughput, augers are 25% larger and the unloading rate is 142 litres per second. Emptying takes less than two minutes via the 8.3-metre unloading auger, which split folds around the back to avoid collisions. 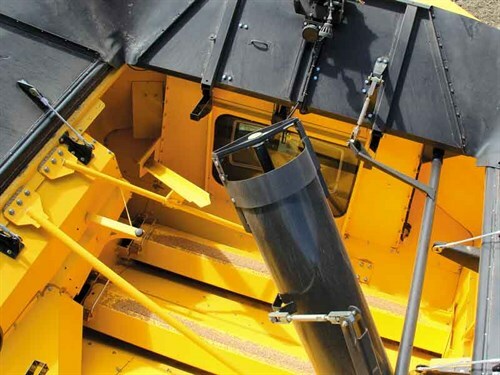 Another smart feature is the movable chute tip that can also be controlled from the cab and allows trailers to be filled in a forage harvester-like fashion, which means less spillage. One question I had before the test drive was how can the machine possibly need so much power? The answer is simple – capacity, and New Holland has created a clever way of harnessing that power and turning it into throughput. This is a highly clever machine. Material is fed head first into the feeder house and accelerated for positive transfer into the rotor by the DFR. The feeder is the same width as the rotors, so there is no narrowing of the crop causing it to slow. It then goes through the gentle yet quick Twin Pitch Plus rotors. Opti Clean takes care of the rest while the self-levelling system keeps things on track. 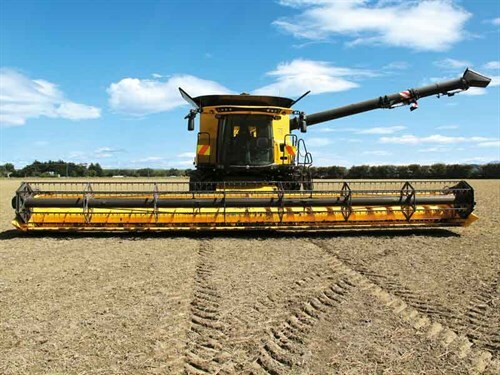 The chaff and straw are chopped and spread all while you are sitting up front in the luxurious air-conditioned seat with 700 horsepower behind you. What’s not to like? The Diesel and Ad Blue tanks are mounted high for refilling at the rear of the machine. This however does help with nearly 1.5 tonnes of weight as a rear ballast for heavy fronts.